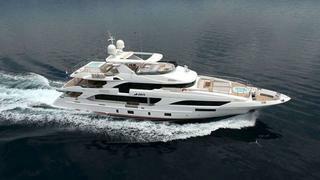 Cornelius Gerling at Edmiston & Company tells me he's listed for sale the 40.2 metre motor yacht Oryx. Built in GRP by Italian superyacht yard Benetti to a design by Stefano Righini and ABS classed, she was delivered in 2013 as one of the yard's acclaimed Classic Supreme series. An interior by Francois Zuretti takes clever advantage of her vast volume and full height windows and is light and airy with a neutral colour palette complemented by cream coloured furnishings. The main saloon has comfortable furniture for relaxation in front of a 50 inch HD television and entertainment centre, and there is a formal dining area forward. The aft deck is expansive and offers al fresco dining for 12 guests while the sun deck comes with sun pads, a fridge, bar, barbecue and a Jacuzzi tub. More comfort is available in the skylounge with ample seating and a 50 inch HD television. Accommodation is for up to 12 guests in five staterooms laid out as full beam master suite on the main deck plus two VIP staterooms and two doubles below, all with full en suite bathroom facilities. Powered by twin 1,450 MTU engines, Oryx is lying in Croatia, asking €16.9 million.